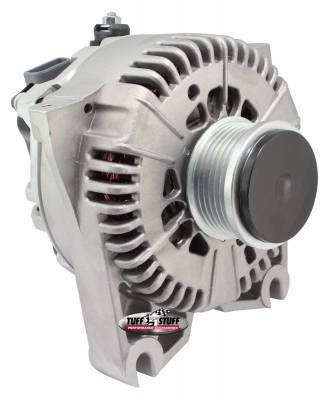 Hybrid alternators for Ford feature a smooth back, a 1-wire internal voltage and a 100 or 140-amp output rating. Available in chrome plated, polished aluminum, stealth black, powder coated colors and Factory Cast PLUS+ finishes. 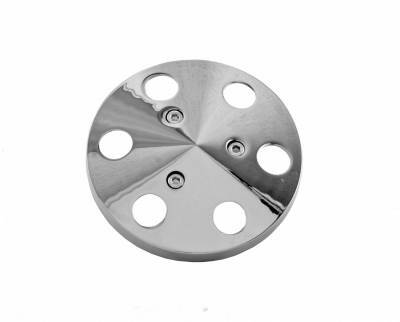 Available in Chrome plated, polished aluminum or Factory Cast PLUS+ finishes. Direct bolt-on factory replacement. 6-Groove pulley. 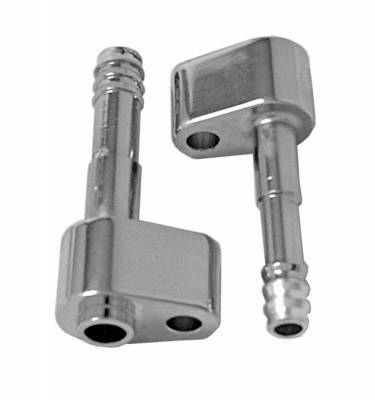 From brake proportioning valves to power brake booster brackets and extension rods, Tuff Stuff offers the brake accessories that you are looking for. From brake proportioning valves to power brake booster brackets, Tuff Stuff offers the brake accessories that you are looking for. 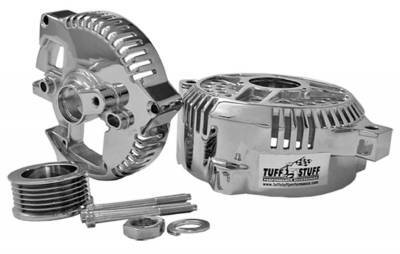 From solid state OEM style and 1-wire voltage regulators to chrome plated alternator case kits and heavy gauge charge wires, Tuff Stuff has all the related products needed to install or rebuild your Chrysler alternator. From pump fittings and pressure valves to mounting kits and pulleys, Tuff Stuff has a complete line of power steering pump accessories. 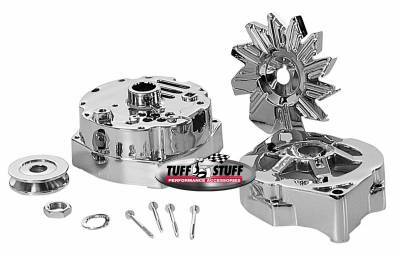 From chrome plated starter housing kits and solenoids to starter shims, bolt kits and replacement components, Tuff Stuff has a complete line of performance starter accessories. Individual relays or complete Hot Start kits, Tuff Stuff has the parts needed to eliminate slow starter cranking due to excessive engine heat. Early style 3-bolt mounting starter is available in chrome plated or stealth black finishes. Tuff Stuff OEM style starters are hand made from premium quality new components - not remanufactured - and are quality built in USA. Ideal for daily drivers, muscle cars, hot rods and trucks.